Our Micro Air Data System 2.0 (µADS) is used where small size and weight are required, and true direct flow measurements are required. The Micro Air Data Computer (µADC) is the heart of the µADS. It incorporates industry-leading air-data reduction algorithms into a compact, lightweight air data computer, which streams and/or logs air data at rates up to 100Hz. The µADS delivers real time angle-of-attack (AoA), angle-of- sideslip (AoS), true airspeed, and altitude using our specially-designed five-hole air data probe that includes an embedded thermocouple for true air temperature measurement. Using data from the probes, the µADC implements air data reduction algorithms to calculate air data from the direct pressure measurements from the multiple ports on the air data probe. With its GPS/INS option, the µADC integrates with an Xsens MTi-G-700 GPS-aided inertial navigation system to provide a complete air data and inertial navigation solution for flight control in very small lightweight package. The µADC with its integrated MTi-G-700 OEM-style GPS/INS provides accurate directly-sensed air flow velocity and angles, along with complete attitude, position, velocity, and acceleration information to be used as inputs for airborne flight control systems. This data is streamed in real-time to a flight controller or can be logged to the µADC on-board flash memory data storage. The µADS meets the needs of an ever-growing UAV market that has expanded applications in scientific research, defense, and commercial industry. One of these applications is for atmospheric research in Antarctica. 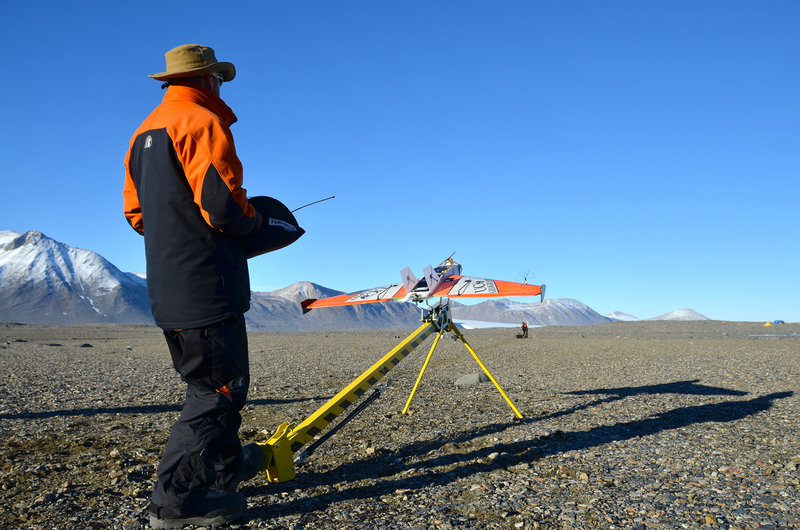 At the Center for Atmospheric Research at the Department of Geography, University of Canterbury in New Zealand, Dr. Marwan Katurji uses the µADS to collect three-dimensional wind turbulence information and derived momentum and heat fluxes to understand the micro-climate of the Dry Valleys of Antarctica. This data will also be used to validate the performance of a numerical weather prediction model that is setup to understand the inter-valley and intra-valley climate connectivities. Shown here are photos of the University of Canterbury UAV application for atmospheric research. This is just one of many applications that the µADS can be utilized for. Other applications of the µADS include Unmanned Ground Vehicle (UGV), Autonomous Underwater Vehicle (AUV), guided missiles, aircraft and general flight testing. The Micro Air Data System is highly accurate and available in custom configurations suitable for all classes of UAVs or any customer-specific application. Integration of the µADC with the MTi-G-700 GPS/INS makes the combination unit a versatile complete data sensing device for all flight control parameters. The µADS can be used for subsonic or supersonic applications, and at high or low altitudes. Custom designed air data probes are also available to suit specialized requirements for aerodynamic flow, probe mounting, probe heating (heater embedded in probe), and/or temperature measurements (embedded total air temperature sensor).